The Sahara desert has been slowly expanding southwards for decades through a region as the Sahel. Heavy grazing, deforestation, and numerous droughts have degraded the once lush Sahel, making it easy pickings for the Sahara’s expansion. In order to stave off an ecological disaster across the continent, 20 different African countries have embarked on an ambitious tree-planting programme called the ‘Great Green Wall’. The 10-mile(16-km) deep wall of green aims to stretch across 5,000 miles (8,000 kilometers) of terrain at the southern edge of the Sahara desert, arresting the desert’s spread. With so much hate surrounding the walls built to divide us, both physical and psychological, it’s refreshing to finally hear about a wall that we can all stand behind. The Great Green Wall was first launched in 2007 at the initiative of 12 African countries — the other 9 joining later The plan is to plant trees that can resist tough droughts — such as acacias — across a narrow region stretching from Senegal in the east of Africa to Djibouti in the west of Africa. Once complete, the wall will run through 11 countries in total. The wall is currently only about 15% complete, but the results are already showing. In Senegal alone, over 11 million trees have been planted since the project rolled out. Nigeria has seen the restoration of 12 million acres of degraded land and Ethiopia has claimed back 37 million acres of land. Aerial photos showing the same area around Galma, a town in Niger. 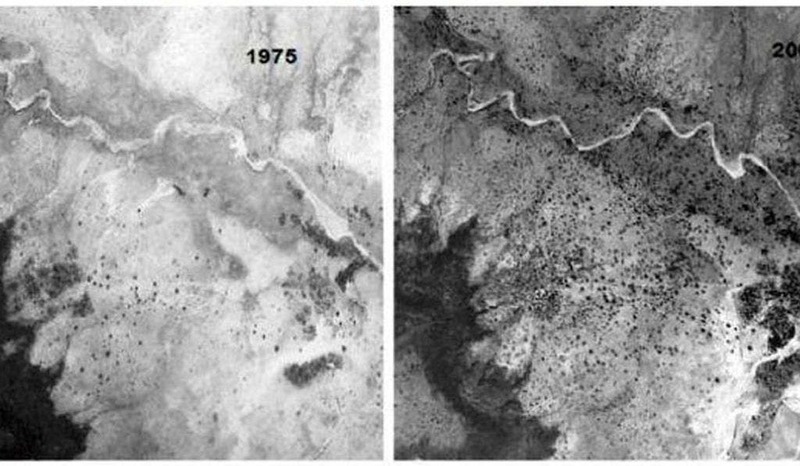 Left: 1975, Right: 2003 after reforestation. Credit: USGS. Tree planting in the Sahel has improved the area’s resilience against desertification. The green wall slows down the drying and scouring effects of the wind, restores micro-climates, and allows food crops to grow around trees which fertilize the soil. The ultimate goal of $8-billion project is to restore 100 million hectares of degraded land by 2030, which would create 350,000 rural jobs and absorb 250 million tons of CO2 from the atmosphere. However, since the project’s inception, some changes to the plan have been made. The idea of the Great Green Wall morphed into a program centered around indigenous land use techniques, not literally planting a forest on the edge of a desert — that would be highly impractical. “It is not necessarily a physical wall, but rather a mosaic of land use practices that ultimately will meet the expectations of a wall. It has been transformed into a metaphorical thing,” said Mohamed Bakarr, the lead environmental specialist for Global Environment Facility. The Great Green Wall is a symbol of hope in an area where, until not too long ago, everyone was panicking over the prospect of the Sahara expanding. There is still much work ahead, though. Some are arguing that the project is moving too slowly. Seeing how the Sahel’s population is expected to double in 20 years, researchers say that regreening needs to be finished within 10 to 15 years.